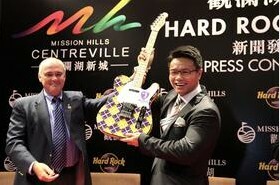 Hamish Dodds, president and CEO of Hard Rock International, and Dr. Ken Chu, chairman of Mission Hills Group, celebrate the announcement of Hard Rock Hotels Shenzhen and Haikou in Shenzhen, China. Hard Rock Hotels & Casinos ranked as the top performance leader in the Americas during the third quarter among the “upper upscale hotels” category, according to the latest Market Metrix Hospitality Index. The index surveys more than 40,000 travelers each quarter to help hospitality businesses measure and improve their performance. Parent company Orlando-based Hard Rock International has 178 venues in 55 countries, including 18 hotels and eight casinos.